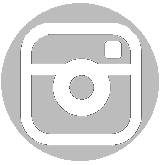 It's nearly 6 years since we started this blog. I had no idea back then just how much blogging and the blogging world would impact on our lives. But I did get a sense of how special it was to connect with people who you may never have otherwise come across and to find a special bond of friendship with them. Two of the blogging friends I had back then - whom I have never met face to face and yet feel I know better than many other friends - whose stories have particularly resonated with me - have so kindly offered to host a guest post about the Juvenile Arthritis Research project which Richard started with the aim of finding a cure for Juvenile Arthritis. So I am incredibly grateful to these two blogging 'besties' - Mich at Mummy from the Heart and Anne at Raisie Bay for helping to spread the word about Juvenile Idiopathic Arthritis and about the JAR project. So please do hop on over to their blogs to have a read...not only of the guest post but about all the things that each of them writes about. Mich has always written so honestly and humbly about real issues and things that we could all do with knowing more about...whether it's raising awareness of charities and good causes, discussing health issues openly, talking about family life and sharing her faith, I am always inspired and encouraged by everything I read on her blog. 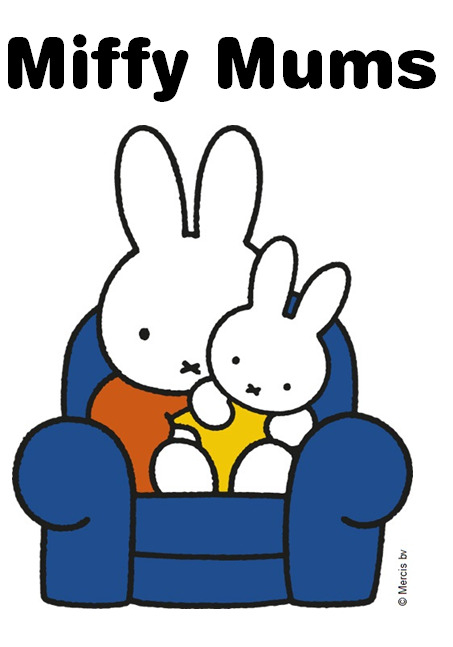 Anne knows only too well what it is like living with an illness which others know little about. What she has done over the years in raising awareness of health issues affecting her and her family whilst going through the challenges that each day brings, is nothing short of miraculous. She is an incredibly strong, wise and inspirational lady whose words always resonate with me. Thank you Mich and Anne for hosting our guest post this week. Here's to many more years of blogging friendship and I hope one day to meet you face to face to say thank you in person! It may be hot, hot, hot outside. In fact it feels like the hottest summer I can remember for years. 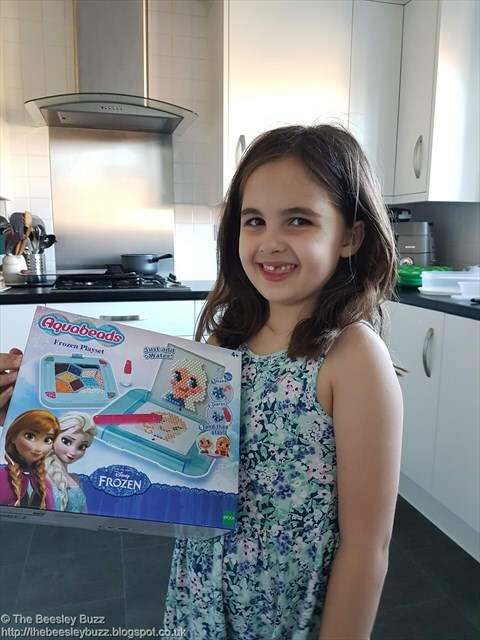 But we've been trying to keep cool as we hide indoors from the heat with the Aquabeads Frozen Playset that Miss T has been sent to review. 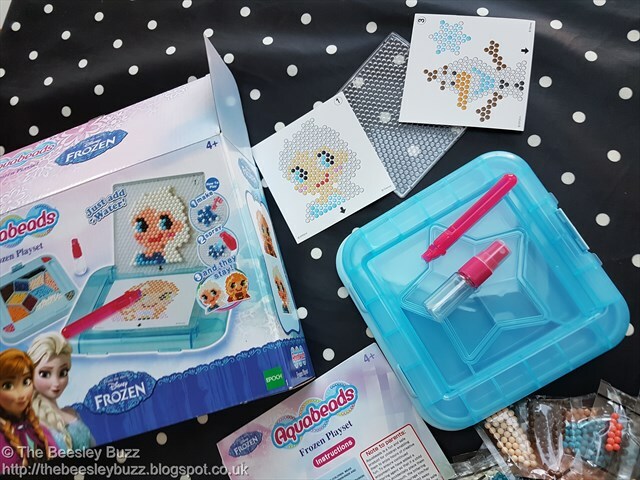 Having creative crafting fun without all the mess - Did you know that as well as the templates that come with each set, you can download a whole host of additional templates from the Aquabeads website (or of course go totally freestyle and create your own designs). The innovations we've seen in the different Aquabeads sets and playsets (like the scraper tool in the Despicable Me Minions playset and the new-style sprayer bottle we've seen introduced recently). The playsets are perfect for storing your beads when not in use to keep them dry in the bead palette because the design table clips securely on top as a cover. 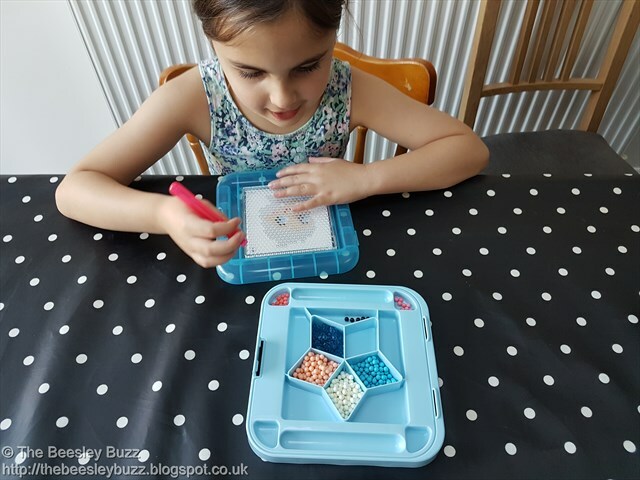 Brilliant for developing fine motor skills - Some of the sets come with bead pens and some don't but either way little fingers get good at picking up those beads and popping them in place. We've finally seemed to work out the difference between the Aquabeads sets and the Aquabeads playsets. It seems the sets are the smaller sets containing beads, templates, a layout tray and water squirter. 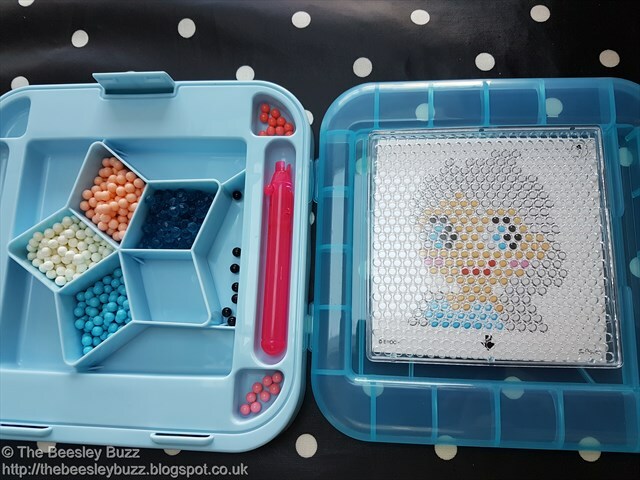 Whilst the playsets contain and bead palette (to sort and store your beads in), a design table to clip onto the bead palette as a lid when not in use and to put your design table on at other times, some playsets do contain a bead pen whilst others don't. The bead pens are available to purchase separately and it is well worth having one if you are an Aquabeads fan. For some of the playsets (like the Star Wars one we previously reviewed here), the design table and layout tray are integrated as one. On the back of each box, it states very clearly what is included so you know exactly what you are getting. 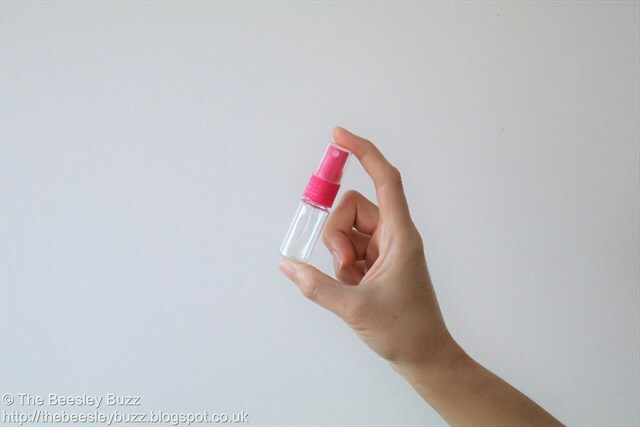 The new style sprayer bottles are brilliant. They give a much lighter even spray of water meaning far less mishaps when spraying the beads. We've found it means that the designs come off the design table far more easily without leaving a residue behind. The beads look nice and shiny too! Miss T had great fun making Elsa from Frozen. The templates included in this playset are Elsa, Anna, Olaf, and some snowflake/ice palace designs. 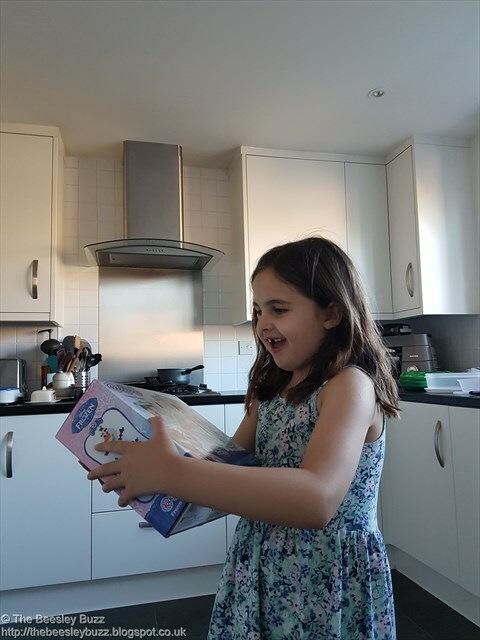 As so many of the components are interchangeable, she was able to simply use the design table layout tray from her very first Aquabeads starter set whilst Elsa was drying on the design table from this playset. And after Anna is finished, I'm sure she will soon be onto Olaf. We've thoroughly enjoyed this playset so far and we've got plenty of play value left to go. You can purchase the Aquabeads Frozen Playset here. Disclosure: As official Aquabeaders, we were sent the Frozen Playset for the purposes of review. All opinions are our own.